When in Africa it is good to expect the unexpected. Wildlife is unpredicatable at the best of times which makes photographing them something of a challenge. You can bump around in the safari vehicle for hours without seeing anything much. You can wait fruitlessly beside sleeping lions waiting for them to stir from their regal slumber and do something exciting. At other times everything seems to happen at once and you don't know where to point your lens first! During my December 2011 trip to Africa one of those unexpected occasions resulted in my favourite wild elephant experience. The incident happened while staying at Kwando's Lagoon camp in Botswana on the banks of the Kwando River. The Kwando river forms part of Botswana's border with Namibia and the Lagoon camp chalet's are situated right on the river bank overlooking the expanses of reeds on the Namibian side of the river. During the afternoon 'siesta' before our evening game drive I happened to see the reeds waving on the other side of the river. 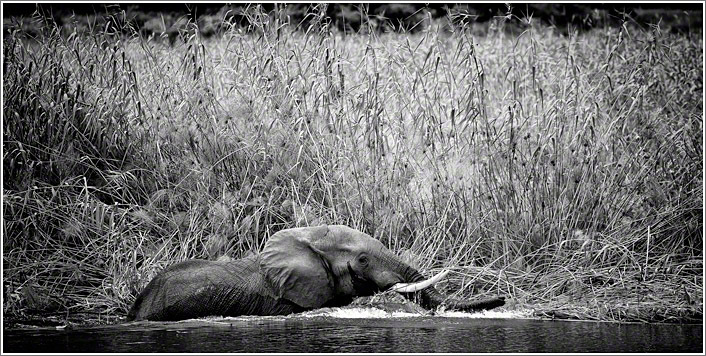 Much to my surprise a lone bull elephant emerged from the reeds and waded into the river. Gary Want (who was sharing the chalet with me) and I scrambled madly for our camera's and lenses and stood on the balcony firing away as the magnificent animal waded along the river's edge then crossed over right beside our chalet. The elephant spent quite some time browsing on the shrubbery behind our chalet and we were able to stand within a few meters and watch which was an exciting experience. Being on foot and at close quarters with a wild elephant makes you feel quite insignificant and not a little insecure! The best photo's had already been had during the river crossing but experiencing Africa's animals is not just about taking photo's of them but being in the moment with them. Another occasion on the trip that shows how unpredictable the wildlife viewing experience can be involved a magnificent male leopard. Transferring between Savuti and the Kwara game concessions we had to land at a bush airstrip about an hours drive from camp. Several safari vehicles were there to meet us and we all crammed in. Much of the luggage was loaded seperately into one of the vehicles. Only 5 minutes from the landing strip and well before our official evening game drive was scheduled one of the drivers spotted a leopard relaxed under a tree. 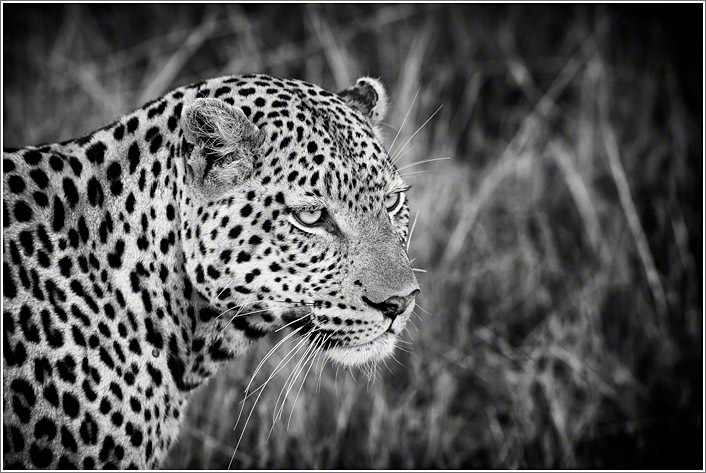 The leopard was a big healthy looking male obviously in the prime of his life and supremely confident in his surroundings. We were able to re-position the vehicles in his travel direction several times as he ambled back towards the landing strip we had just come from. He completely ignored the vehicles and passed so close to us that my 500mm lens was overkill and I shot mostly with a 70-200 and a 300mm. Unfortunately a couple of members of the party had managed to get themselves seperated from their camera bags during the post flight luggage loading and could only watch the 'drama' unfold without a camera in hand. The leopard went on to put in a half hearted hunting attempt, targeting a couple of warthogs right on the airstrip. The hunt was unsuccessful as we expected as there was no ground cover at all. The leopard then headed off into a neighboring game concession and we let him be. Resuming our interrupted drive towards the camp again we soon got a call on the radio about another leopard sighting which prompted us to go dashing off road again. This time finding a beautiful female leopard which we followed through the bush for about an hour. The photo's were not as good this time as she spent a lot of time in long undergrowth but it was a fun experience nonetheless. We finally arrived at the new camp much later than expected, tired but happy. The moral to the story is expect the unexpected and don't be too far away from your camera when in Africa's game parks!